^ Gibbons, Ivan (1985). Walks Around the Bush: Three Walks Looking at the Local History and Architecture of Shepherds Bush (West London). Addison P. pp. 48. ISBN 978-0907693055. ^ Evinson, Denis (1998). 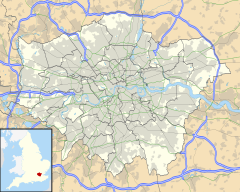 Catholic Churches of London. Sheffield Academic Press Ltd. p. 128. http://books.google.com/books?id=2gTN5BuRpZEC&pg=PA128&dq=shepherds+bush&hl=en&ei=UF4TTr7OIZGXhQeX7aXmDQ&sa=X&oi=book_result&ct=result&resnum=4&ved=0CDwQ6AEwAw#v=onepage&q=shepherds%20bush&f=false 2012年4月3日閲覧。. ^ Watson, Frederick (1934). The Life of Sir Robert Jones. Baltimore: W.Wood. p. 164. http://books.google.com/books?id=hX4i-WbW5kMC&pg=PA164&dq=shepherds+bush&hl=en&ei=UF4TTr7OIZGXhQeX7aXmDQ&sa=X&oi=book_result&ct=result&resnum=7&ved=0CEsQ6AEwBg#v=onepage&q&f=false 2012年4月3日閲覧。. ^ Reznick, Jeffrey Stephen (2004). Healing the Nation: Soldiers and the Culture of Caregiving in Britain. p. 116. ISBN 0719069742. http://books.google.com/books?id=lE3qgYD-7I4C&pg=PA116&dq=shepherds+bush&hl=en&ei=UF4TTr7OIZGXhQeX7aXmDQ&sa=X&oi=book_result&ct=result&resnum=8&ved=0CFAQ6AEwBw#v=onepage&q&f=false 2012年4月3日閲覧。. ^ Gerber, David, A. (2000). Disabled veterans in history. University of Michigan. ISBN 0472110330. http://books.google.com/books?id=Vxi-T1yJOUgC&pg=PA191&dq=shepherds+bush&hl=en&ei=lmsTTsnhA4iAhQemqKjLDQ&sa=X&oi=book_result&ct=result&resnum=7&ved=0CE0Q6AEwBjgK#v=onepage&q&f=false 2012年4月3日閲覧。. ^ Bibe (2011). A Victim. p. 20. ISBN 9781456856908. http://books.google.com/books?id=OvZOl56c7N8C&pg=PA20&dq=shepherds+bush&hl=en&ei=UF4TTr7OIZGXhQeX7aXmDQ&sa=X&oi=book_result&ct=result&resnum=5&ved=0CEEQ6AEwBA#v=onepage&q=shepherds%20bush&f=false 2012年4月3日閲覧。. ^ Schreuders, Piet (2008-03-25). Beatles London. Portico. p. 141. ISBN 978-1906032265. http://books.google.com/books?id=2N53-a3FafQC&pg=PA141&dq=shepherds+bush&hl=en&ei=UF4TTr7OIZGXhQeX7aXmDQ&sa=X&oi=book_result&ct=result&resnum=3&ved=0CDUQ6AEwAg#v=onepage&q=shepherds%20bush&f=false 2011年4月3日閲覧。.